An analysis of satellite data fore last 15 years confirms that up to 20 percent of the Russian Arctic has been affected by greening. Rapid warming in the Arctic, and the resulting chain reaction, are turning the polar region into a green area. These changes in climate might have an irreversible impact on many species, such as the lemming. “In just 20 years we went from 1–3 percent environmentally compromised territory in Russia's Arctic, to almost 15 percent today. It’s already a very different land these days”, said Arkady Tishkov from the Institute of Geography during the Arctic Days forum that opened in Moscow on November 21. Earlier this year NASA presented satellite data gathered over the last three decades that showed a clear greening trend in North America's Arctic, especially in northeastern Canada. ‘Greening’ in this case means changes in land vegetation — from lichen to grass and shrubbery — which makes the Arctic greener in the summer. Climate researchers blame this trend on human activity. Another 2016 research paper suggests that increased atmospheric CO2, which plants use in photosynthesis, and climate change account for nearly 80 percent of the observed ‘greening’ at higher latitudes and elsewhere on Earth. An analysis of satellite data fore last 15 years confirms that up to 20 percent of the Russian Arctic has been affected by greening, and it’s not just small plants. In the Pechora river region in northwestern Russia, trees can now be found remarkably close to the Arctic shore. Invasive species such as grasses, as well as many weeds, are also advancing north both naturally and “hitching a ride” with people and transportation. All these changes in climate and the ecosystem might be irreversible for many iconic species of the Russian Arctic, such as the lemming, said Tishkov. Three decades of monitoring in northeastern Siberia confirmed a natural cycle with major explosions in Arctic lemming populations every two to five years. But climate change tends to flatten this cycle, ‘cutting off’ peaks which are crucial not just to the species itself but to many predators feeding on it. Since the late 1990s these peaks are virtually nonexistent, Tishkov showed in his report. Some animals may potentially benefit from grassier, more luscious tundra. 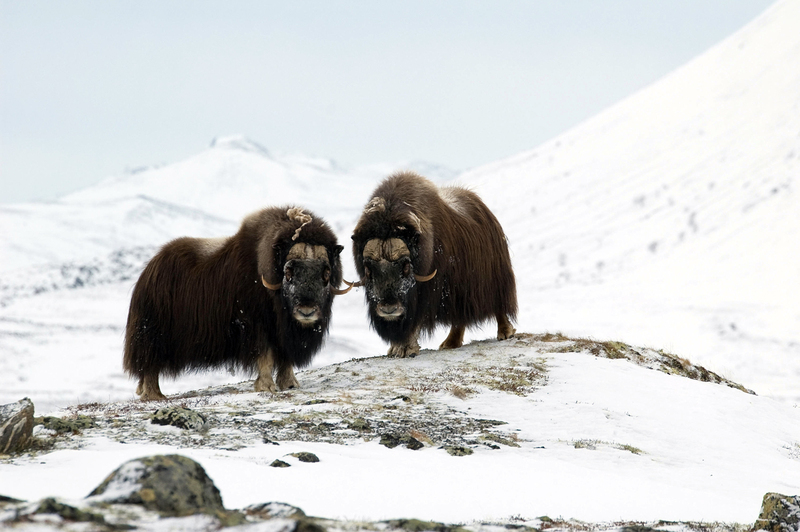 Taras Sipko of the Severtsov Institute of Ecology and Evolution presented field research and observations of muskoxen, which were first reintroduced to the Russian Arctic in the 1970s from Canada. These populations have been growing quite well and reached more than 10,000 in the 2010s. Reindeer, however, may be facing a one–two punch. Their habitat is increasingly fragmented, shrinking from a broad strip all over north Russia to isolated patches in the Arctic in a matter of a century. Moreover, as Arkady Tishkov noted, the type of changes in vegetation now observed do not help the deer survive. As winters become warmer, traditional migration patterns get disrupted, and some deer on the Taymyr Peninsula have even stopped leaving the Far North. Recent NOAA satellite data shows some indication that overall Arctic greening may have slowed down and even reversed after 2010, although notably less so in Russia. The report, however, warns that local and more detailed field observations still show more greening.